A few years back, the prime minister of Canada Stephen Harper issued a formal statement of apology on behalf of Canada for the Indian residential school system and the devastation wrought against the children who were forced to attend those schools and to the damage inflicted upon families, communities, nations. Among these was the destruction of family ties, culture and language. Many people, Native people who’d lived their lives as survivors, many who had been physically and sexually abused or lost brothers and sisters to tuberculosis infested schools (yes there is documentation of this) hoped for this long sought after apology. Many of these people felt that, while it might have come too late for them personally, conditions would improve, that measurable and concrete amends would be enacted. Instead what many experienced most was a sense of betrayal at what they saw was a government behaving and acting legislatively in a manner quite opposite and false to the words uttered by Harper. When I started this painting, the Truth and Reconciliation hearings were getting under way across Canada. Prerequisite to receiving the ‘apology’, the Harper government insisted that there be no more lawsuits commence on behalf of victims of the residential schools, no more criminal charges brought forward. Instead they would get the Truth and Reconciliation hearings. In addition many astute observers notice that Harper never apologized for the government….he apologized for the abuses of the churches that ran the schools at the behest of Canada’s Indian department and government. What inspired me to paint this picture was the thought of how many, many Native people had long before the (false) apology begun a process of healing which included rejecting shame for the cultures of their ancestors instilled by the genocidal residential school system. One expression of that was the formation of healing circles in which speakers would share openly with others the sufferings they had endured. The speaker holding an eagle feather is accorded the open ears of the fellow participants, who listen with unconditional empathy and the assumption that he or she who holds the feather is speaking honestly from the heart. I also thought of the courage of the many survivors who gathered in cities and towns to share their stories. 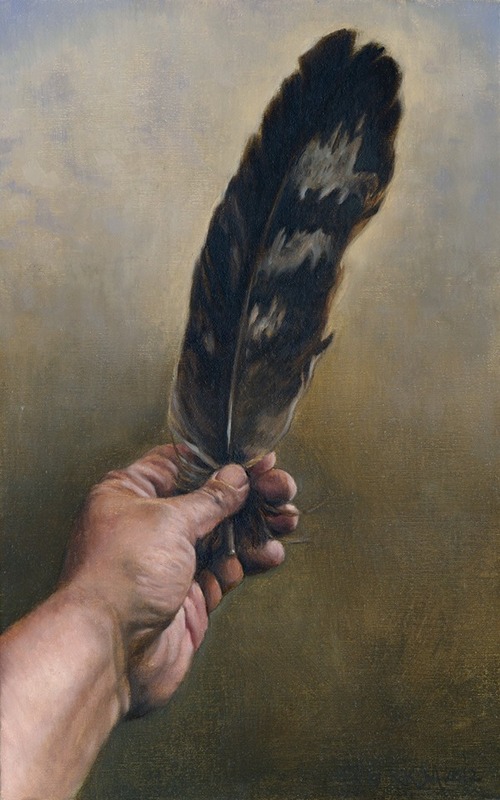 The hand in the picture is my own as is the feather…so in a way, it is a self-portrait…not that I had ever attended a residential school but that I nonetheless have lived and experienced the fallout of that era as have my children and grand children. My longing for healing is for those loved ones. My hope for healing is not based on what Harper’s government continues to do to decimate our rights as nations. It’s not based upon what Harper’s government paternalistically claims it is doing for our own good. It is based upon my own refusal to allow my grandchildren to live their lives as victims and the understanding that any true healing and reconciliation does not stem from legalistic maneuvering but from the power of what we in Mohawk country refer to as the power of the good mind. It is funny and, then again, not so funny perhaps when one realizes one might have been caught up in the moment and misspoke. Case in point, I would add a note in postscript to the video I posted previously.. In it I am recorded making a statement to the effect that there hasn’t been a place to exhibit art in Kahnawake. That statement constitutes an error of omission. What I meant to say was that in Kahnawake there has not been, at least not in recent memory, a commercial gallery space dedicated to the exhibition of Native artists work. The reality is that the Kanien’kehaka Raotitiohkwa Cultural Center of Kahnawake has for many years provided exhibition space for Native artists among the many cultural endeavors it pursues, language preservation, programming and curriculum development being prime examples. The KRCC had and continues to provide a space for the exhibition of artist at all levels and has more than generously hosted vernnisages and promoted these exhibitions, owing to the tireless work of Martin Loft of the KRCC in no small part. Indeed Martin, an artist himself in photography, printmaking and jewelry, has been a champion of this aspect of the KRCC’s mandate. It is important to me as an artist and as a human being to be quick to correct one’s own missteps as soon as one realizes the error of one’s ways. What do I really think about everything? Everything is a lot of stuff so perhaps it would have been more realistic of me to pose another question. What do I really think about art, for instance? “What do I really think about the act of painting?” would be another along with “Why would anyone be interested in what I have to say about anything, let alone everything? My briefest answer would be ‘connection.’ Let’s get connected. Let’s begin. It has been said that a picture tells a 1000 words …that being the case, what about a video?